Red-Nosed Yeti Fly Tying Kit! The Red-Nosed Yeti has proven to be an incredibly effective fly for white bass, and we are pleased to offer this exciting new Tie It & Try It kit to help you learn to tie and fish this incredible fly! The kit includes materials to tie at least 20 Red-Nosed Yetis and includes everything you'll need except a spool of red thread, which you probably already have anyway. The kit also includes a fully illustrated 20-page tying guide featuring the clear, easy-to-follow step-by-step tying illustrations that our kits are known for. Besides being great for white bass, the Red-Nosed Yeti works exceptionally well on hybrids and stripers too -- and it's a very effective pattern on many trout waters as well! Only $18.95! Order your Red-Nosed Yeti Kit today! We are pleased to announce the publication of CHATTAHOOCHEE TROUT, our brand-new, all-inclusive guide to trout fishing on the Chattahoochee River! This 328-page guide covers all of the river's trout water, from the remote headwaters in the mountains to the tailwaters through Atlanta, with practical tips on tackle and tactics...insights from experienced river guides...suggestions on flies and lures...tips to help you understand tailwater releases...and almost 40 detailed maps to guide you along the way. Whether you are a fly fisher or spinning enthusiast, this exciting new book gives you all the info you need to enjoy the incredible trout fishing that the Chattahoochee has to offer! It's a great addition to any fishing library - and a perfect gift for any angler on your list! 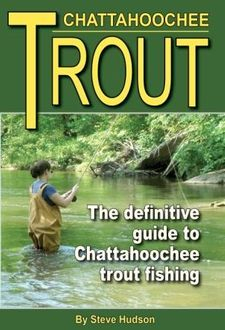 "A must-have guide for anyone who fishes the Chattahoochee River!" says Chris Scalley, River Through Atlanta Guide Service.